When we look at many cultures the creation stories and perfect places involve a beautiful, tranquil Garden. 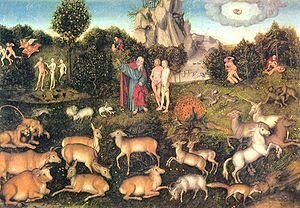 There is the Judeo-Christian "Garden of Eden", a kind of Golden Age of existence. In Kenya the Djaga people also speak of a beautiful Garden where also there was a fruit not to be eaten. In many cultures such stories involve a sacred apple tree. In Hawaii the first man, Kumu Honua, and first woman, Lalo-Honua live in a beautiful Garden and are also told not to eat from a sacred apple tree. However as in Eden they both break this direction are driven out of the perfect Garden. 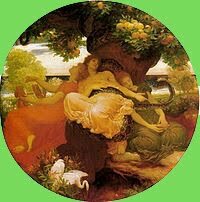 In the Greek myth there was the Garden of Hesperides which was an orchard, Gaia's wedding gift to Hera, where the golden apples were guarded by the daughters of Atlas and the dragon, Ladon. Noone was allowed to have them but the Greek hero Hercules was ordered, as his eleventh labour (he had to carry out 12) to steal them. 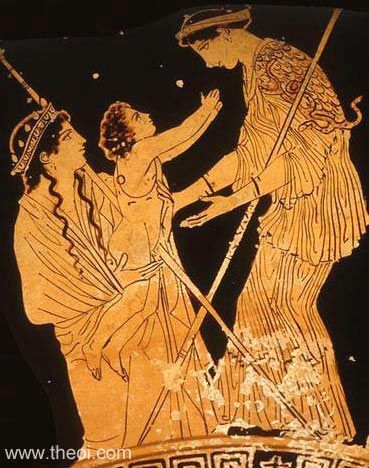 He did this successfully but they eventually found their way back to the Garden via the goddess Athena. by Frederick, Lord Leighton, 1892. In Celtic myth Avalon was the island of the blessed where the apples of immortality grew. In this garden it is said King Arthur withdrew to heal his wound. 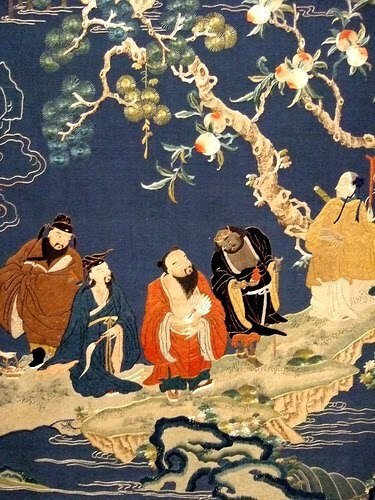 However in China the Garden was the Orchard of Immortal Peaches. The Garden belonged to the Queen Mother of the West, Xi Wang Mu. In Japenese she was known as the great goddess Seibo. In China, Japan, Korea she was known as the Divine Mother, the Dispenser of Prosperity and Eternal Bliss. Every 6000 years(some accounts write every 3,000 years) she would hold a great feast in which the immortals would eat the peaches in order to renew their immortality. However she was also known for serving peaches to her human guests and making them immortal. 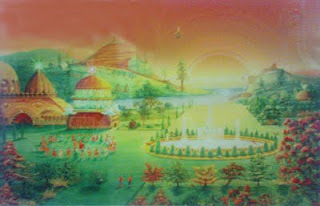 The 'Garden of Allah' was the heaven of the Muslims. The beautiful Islamic gardens created in southern Spain had this idea, to create gardens that in a small way could faintly approximate the Garden of Paradise. It is said that the Mixtec Indians of Mexico had a creation myth set in a Garden. The Native American Navajo and Pueblos Indians believed that creation began with the emergence of people from the underworld onto the present surface world. Emergence was connected to agriculture and to rebirth just like seeds that emerge from the darkness of the earth then sprout, grow, bloom, die and return to the soil in a process that repeats continually. Prajapita Brahma,the founder of the Brahma Kumaris University, in 1936 was given a vision of a great and global upheaval,after this he saw a global, beautiful garden. From the sky came points of light that when they touched the earth turned into lovely, harmonious human beings. He was told that this Golden Age of Hunmaity had existed in the past and would exist again in the future. He was told that this appearing and disappearing of the Golden Garden would happen for all eternity in repeating cycles of time. When we see the early Renaissance gardens of the 15th or 16th century Italy, which used the work of the Roman Pliny as a model for structuring their gardens, we see how Italy influenced the idea of a garden as a work of art. In France, the Versailles Garden of the 17th century became a model for all of Europe till the middle of the18th century when England in the 18th century also developed the garden as an art form in a somewhat form, basically less ornate and grandiose. Painters, architects, sculptures, poets and philosophers were all involved in the formulating the reasons and methods for creating a garden. Everyone was involved in creating the garden from the landowner, to the sculptor to the poet to the actual gardener. Before the Renaissance gardens of Italy the monasteries of Europe had small gardens, where they grew herbs, vegetables, fruit trees and flowers. 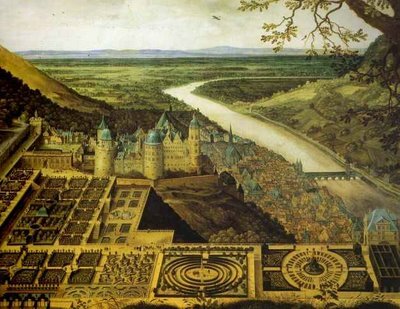 Gardens were not primarily ornamental as was in the Renaissance but primarily functional, providing food and medicinal herbs for the monastery. Also the monastic garden was a place for quiet reflection, meditation and prayer. Essentially it was both a sanctuary and a provider of basic needs. In 1462 Cosimo di Medici wrote a letter to the leader of the Platonic Academy, the neo-Platonic philosopher Marsilio Ficino: "yesterday I came to the villa of Careggi, not to cultivate my fields but my soul. 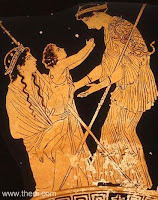 Bring with you our Plato's book 'De Summo Bono". The simplicity of early Florentine gardens was a product of the desire to cultivate one's soul and, though minimised later, it still played a small part in the garden art of France and particularly England. Going back in time we see in the Egyptian tombs, gardens depicted with lotus ponds and rows of palms in the homes of the richer Egyptians. However in the homes of the poorer people the garden was not ornamental but served to grow the vegetables and fruits which without careful irrigation and watering, could not grow in the dry, sandy soil and very hot weather of the country. 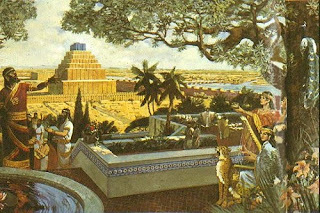 We also hear of the Hanging Gardens of Babylon, famed as one of the seven wonders of the ancient world. Some say King Nebuchadnezzar II built it to please his Persian wife, who missed the green hills of her homeland. It is said the most influential gardens in the western world were Ptolemy's gardens at ancient Alexandria of Egypt, around the vicinity the Great Library. 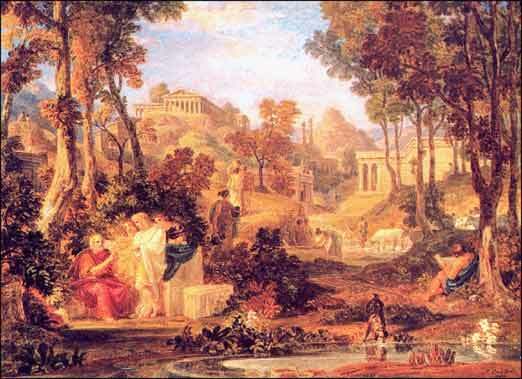 As all gardens in Hellenic times the garden was regarded as a sacred place, a natural temple. 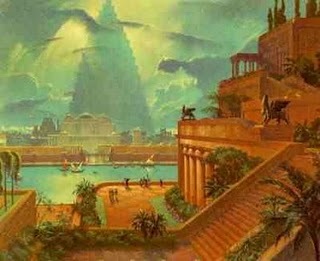 These gardens were groves, sacred to the various deities. In ancient Rome behind the temple of the Vestal Virgins was a sacred grove, an extension of the temple to the goddess Vesta. In Temple of Uppsala in old Uppsala every tree of the grove was declared sacred and was never to be cut down or injured. Sacred groves of varying sizes were the norm in India, where areas of trees and plants were revered as holy places to be respected and never damaged.No hunting was allowed there and they were regarded as repositories for the making of Ayurvedic medicine. It is estimated that there are now over 14.000 such groves, other estimates say 100.000, some of which are now regarded as important for the ecosytems of those areas and are protected by law. The Indians regarded the first temple as nature. This idea is found also in the ancient Greeks, Germanic, Baltic and Scandinavian countries, Celts, Japan, China and other cultures. Plato's Academy of Athens also had a garden but mainly consisting of sacred groves of olives and statues of the hero 'Academus' and the goddess Athena. On philosopher Epicurus founded a school named 'The Garden'. His school of philosophy was so named because he used his extensive garden as the students' meeting place. He encouraged 'seclusion', that is, to get through life without drawing attention to yourself. So he thought the quiet and secluded garden was a good place to start for his students! Not pursuing glory, wealth or power but instead "learning to enjoy the little things of life..." was his main philosophy. The idea of seclusion and reflection, always present in the monastic traditions, is also found in the English and French landscape gardens of the 18th century which gradually grew into the idea of public parks today. In those early English and French landscape gardens there were corners, niches set aside for an individual to be quiet and reflective. And in Padova Italy in 1545 the first botanic garden in Europe was created. Not only with order, beauty and symmetry but with native herbs, fruit trees, flowers, trees but also many plants from other countries. This idea of finding and planting non-native plants, especially exotic ones, though first started in Padova was taken up by other countries, especially England, in a major way. The evolution of personal, large gardens into municipal public parks throughout the world has brought many benefits. When they are large and abundant they become 'the lungs' of a metropolis not only in terms of oxygen but also they create a closeness and connectedness to Nature, which urban dwellers appreciate and need. More and more as environmental consciousness grows, people are seeking and have achieved sustainable design practices of gardens, whatever the size, that create personal well being in the city they inhabit. Such things as green roofs, green spaces, organic vegetable plots, even if only on a very small scale, provide new alternatives. And as people hear about the prevalent use of insecticides, unscrupulous use of genetic modification there is a great incentive "to plant one's own".